To some extent the pottery used in Devon during the later Roman period also represents a diluted version of the supply system to the east in Dorset and Somerset. BB1 from south-east Dorset reached Exeter and the remainder of east Devon, but in lesser quantities than to the east. It had to compete with South Devon ware (SDBB), which became increasingly important throughout the 3rd and 4th centuries (Holbrook and Bidwell 1991, 21-3), and in the 3rd century with local gritty grey wares. Beyond Exeter, South Devon ware was predominant, though most assemblages include at least small amounts of BB1. The two commonest finewares in southern Britain – Oxfordshire and New Forest wares (OXRS, NFCC) – occur at Exeter. New Forest ware has been found on a single site west of Exeter (see Postscript), but Oxfordshire ware vessels occur on sites throughout Devon and Cornwall, though only in small numbers (occurrences in Cornwall are listed in Quinnell 2004, 104). Later 3rd- and 4th-century imports from south-west France (céramique à l'éponge, EPON) and North African and Eastern Mediterranean amphorae of this period are restricted to Exeter, with the exception of bowls in céramique à l'éponge from Holcombe and Aller Cross (Holbrook and Bidwell 1991, 21, 217-18; Postscript). By the 4th century coarsewares in Devon consisted mainly of BB1 from south-east Dorset, South Devon ware and South-Western Storage Jars. These wares occur in varying quantities according to the status and location of sites. Much of the BB1 consists of the standard types that were distributed throughout Britain apart from a few areas of eastern England. In Devon the latest types only occur at Exeter, as follows (the type numbers are those in Holbrook and Bidwell 1991 for BB1 from south-east Dorset). Type 20.2: a bulbous cooking pot with herring-bone decoration, as at the BB1 production site at Bestwall Quarry (Lyne 2012, Class 1/9), there dated to c. AD 350/70-400+. A single example is known from Exeter at Holloway Street (1978), an isolated pit on a site south of the walled town (Figure 2, no. 1). An unpublished cooking pot from Rack Street (1977) has diagonal lines rather than lattice on its decorated zone, as on Type 21.1 (see below); it was found in a later 4th-century demolition layer (context 1109) associated with buildings fronting a road that led to the west gate of the town. Type 21: a squat jar with a narrow band of lattice or diagonal lines (Greyhound Yard Type 18: Seager Smith and Davies 1993, 233, fig. 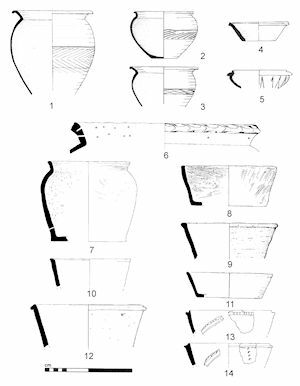 123; Bestwall Quarry, Class 2 necked bowls: Lyne 2012, fig. 145, dating the class generally to c. AD 350/70-420+); this distinctive type has been discussed by Gerrard (2004, and also this issue). Only two examples are known from Exeter, both from the late 4th- to early 5th-century sequence at Trichay Street (Figure 2, nos 2-3; Holbrook and Bidwell 1991, 103). Type 47: an undecorated conical bowl with a vestigial flange, similar to Class 6/11-12 in oxidised or black vesicular BB1 at Bestwall Quarry, there dated to c. AD 370-420+ (Lyne 2012, 213). Parallels cited by Holbrook and Bidwell (1991, 109), including examples of the type in wheel-thrown greyware from Bath and in a BB1 fabric apparently not in standard BB1 from Cirencester, confirm its late 4th-century dating. Two examples are known from Exeter, one from Goldsmith Street and the other from a small site east of the basilica and forum (Figure 2, no. 4). Also worth noting is Type 27, a large piecrust or rope-rimmed storage jar that occurs in the same oxidised fabric at sites in Dorset (Greyhound Yard Type 12, Seager Smith and Davies 1993, 233, fig. 123; Bestwall Quarry, Class 13/2; Lyne 2012) and at the Holcombe villa (Pollard and Allan 1974, fig. 21, 142). As Gerrard (2010, 296, 306) has shown, the type emerged around the middle of the 4th century in a fabric that he describes as South-East Dorset Orange Wiped Ware (SEDOWW), a late variant of BB1. The only example from Exeter was found unstratified on the basilica and forum site, but it might well have arrived there during the same final phase of BB1 importation as the other rare types noted above (Figure 2, no. 6). A bowl from a mid- to late 4th-century context at Trichay Street (Type 48; Figure 2, no. 5) with a rounded profile and a flange is perhaps related to the 'flange-necked and lid-seated' vessels at Bestwall Quarry (Lyne 2012, Class 3). There can be little doubt that Exeter depended on the supply of BB1 for as long as the use of pottery in the Romano-British tradition continued in the town. In contrast with assemblages elsewhere in Devon, South Devon ware, the only other readily available coarseware, never exceeds the quantity of BB1 in 4th-century or possibly later groups, either in comparisons of weight or minimum numbers (Holbrook and Bidwell 1991, figs 5-6). If South Devon ware had eventually superseded BB1 entirely, there should be at least some groups of the late 4th century or beyond where the former ware predominated, even if other groups of the same date contained greater amounts of residual BB1, and there are no groups of any size where this is the case. The types of BB1 in the latest groups at Exeter, for example those at Trichay Street that are of late 4th- or early 5th-century date (for the sequence, see Bidwell 1980, 69-72, figs 38-9 and Holbrook and Bidwell 1991, 13, microfiche 000035), bear very little resemblance to those of about the same date from the BB1 production site at Bestwall Quarry (Lyne 2012). There is no reason to think that the Bestwall Quarry pottery is later than that at Exeter: the late types described above that are common at this production site are also far from common at less distant consumer sites such as Dorchester. It is possible that there were other BB1 production sites at the end of the Roman period producing a more conservative range of wares for export and that the Bestwall Quarry site was supplying a different range of types mainly for local consumption. The distribution and typology of South Devon ware has been discussed in detail elsewhere (Bidwell and Silvester 1988; Holbrook and Bidwell 1991, 177-81; for South Devon ware in Cornwall, see Quinnell 2004, 107-8). At Exeter the largest quantities (though always less than those of BB1) are from the latest deposits (Holbrook and Bidwell 1991, fig. 6); west of Exeter and at small enclosures in the Exe valley, even larger quantities occur in the later Roman period (Holbrook and Bidwell 1991, 21-3, 178). Moving east of Exeter the ware rapidly becomes scarcer: at Clyst Honiton, an enclosure 7km from Exeter, 47.4% by weight of the pottery was South Devon ware (Holbrook 1989), but at Pomeroy Wood, a further 14km to the east along the Fosse Way, it made up only 5% by weight of the coarsewares in late 3rd to 4th-century deposits (Seager Smith 1999, 307). 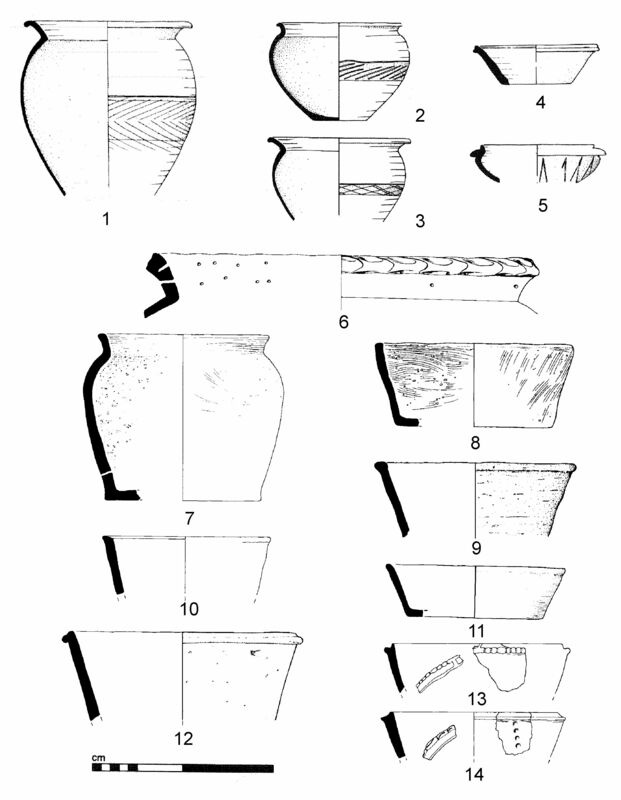 South-Western Grey Ware Storage Jars (Holbrook and Bidwell 1991, 175) were still current in the second half of the 4th century, as is shown by an example used as an oven from the Phase Vc kitchen midden at Holcombe (Pollard and Allan 1974, fig. 21, no. 139). Apart from Exeter, none of the sites in east Devon say anything about pottery use into the 5th century, though Pomeroy Wood, Woodbury and Holcombe have pottery of the second half of the 4th century. The coin-series at Exeter virtually comes to an end with Valentinianic issues of 364-375 (Reece 1991, 35); the villa at Holcombe is the only site excavated elsewhere in Devon to have produced coins as late as Valentinian (cf. Walton and Moorhead's article in this issue). The only later coins from Exeter are from the insulae north-west and north-east of the forum, and the two most distinctive late BB1 types (21 and 47, noted above) are only known from the north-western of these two areas (Holbrook and Bidwell 1991, 11-13, fig. 4). It seems that in the last quarter of the 4th century, occupation within the walls of the town had largely retreated to its core (work to date on the pottery from the Princesshay site in the eastern quadrant of the walled area, which is the only site with extensive later Roman deposits to have been examined at Exeter since the 1970s, suggests that the occupation conformed to this pattern; the coin-list is not yet available). For how long the core area remained inhabited is uncertain. There was a sequence of activity at Trichay Street, noted above, which probably continued into the 5th century; it is similar to some of the late sequences at Dorchester, summarised by Gerrard (2010, 296-302). Otherwise, the only signs of 5th-century (or possibly 6th-century) activity at Exeter are six burials on the site of the basilica and forum that are probably part of a more extensive cemetery. Two of the burials produced uncalibrated radiocarbon dates of AD 420 and AD 490 (Bidwell 1979, 110-11, fig. 32).